Kakamega High School reclaimed the national secondary school ball games football title with a 1-0 win over Central region’s Olbolosat with Henry Atola scoring a stoppage time winner in a highly entertaining final in Eldoret on Saturday. Kwale Girls meanwhile won the girls’ title after whitewashing Arch Bishop Njenga 3-1. Elsewhere,, St. Antony’s Boys Kitale won the Copa Cocacola title after beating St. Peters Mumias 3-1 on post match penalties while debutants Moi Girls Nangili beat Wiyeta 2-0 to win the girls’ title. However, it was the Kakamega High and Olbolosat final that attracted a huge number of fans and was fittingly the show stopper of the week-long championship held at the Hill School. While Kakamega bossed possession and the chances to score, Olbolosat defended neatly and were only undone at the death with Atola sneaking in the victory. The Green Commandos had their first chance of the game in the ninth minute when skipper Alpha Onyango’s shot from distance was turned behind for a corner by keeper Victor Mwangi. The Olbolosat shot stopper was the difference between Kakamega and the opening goal, doing well to man his posts and pull incredible saves. So good was his performance that Education Principal Secretary Bellio Kipsang who was the chief guest lauded his individual show during his speech. Mwangi, nicknamed Ospina by his teammates pulled off a brilliant save in the 23rd minute to tip Alpha’s freekick onto the crossbar and recovering in time to block the rebound from Atola. Olbolosat had their first chance at goal three minutes from half time when Silah Wangila tried his luck with a snap shot from range which went over. In the second half, Kakamega kept their front playing style and should have been ahead in the 63rd minute but Evans Odhiambo’s cracking effort from the right was beautifully saved by Mwangi. In the 68th minute, Joshua Otieno tried his luck with another rasping effort from distance but it flew a few millimeters over the bar. Kakamega pushed and pushed and were ultimately rewarded at the death when Atola sneaked in at the near post to glance in a header from Samson Otieno’s corner. 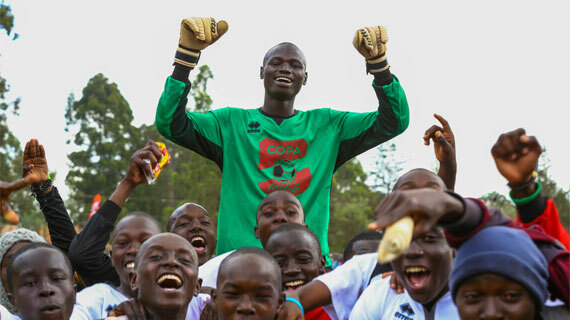 In the Under-16 Copa Cocacola category, St. Antony’s goalkeeper Issa Emuria was the hero of the side saving three penalties as the Kitale based team clinched the title. Emuria saved the first two kicks taken by captain Felix Otieno and James Wafula, using his height to his advantage. For St. Antony’s Christopher Raila and Leon David scored to give them a 2-0 advantage, but the same came under threat when Woodvine Okoth saw his kick saved and Brian Mbithi scored for St. Peters for a 2-1 lead. However, Rashid Issa atoned for his mate’s miss scoring St. Antony’s fourth kick with his keeper Emuria putting the game to bed saving from Salim Badi. Earlier on debutants Moi Girls Nangili won the girls’ title after outsmarting last year’s finalists Wiyeta Girls 2-0 with goals from Noelle Oruko and Ivy Chepkurui handing them the title. Oruko broke the deadlock in the 28th minute when she volleyed the ball home after racing onto the ball which was planted behind the defense. In the second half, Wiyeta had a chance to draw level through Jecinta Karemana whose shot from range fizzled through the goalkeeper’s legs, but she managed to react quickly to pick up before it crossed the line. Chepkurui put the icing on the cake in sublime fashion 15 minutes after the restart with a wonderful goal taken from the halfway line, her shot catching the Wiyeta keeper off guard.